Industry research indicates that nurses spend 12% of their time completing workarounds that are not in their job description. This adds up to one hour spent on workarounds per each eight-hour shift. Nurse-ready patient rooms are properly cleaned and staged with patient-specific equipment and supplies so nurses can deliver exceptional care at the top of their license. This operational model positively impacts nursing satisfaction with each new patient admission. 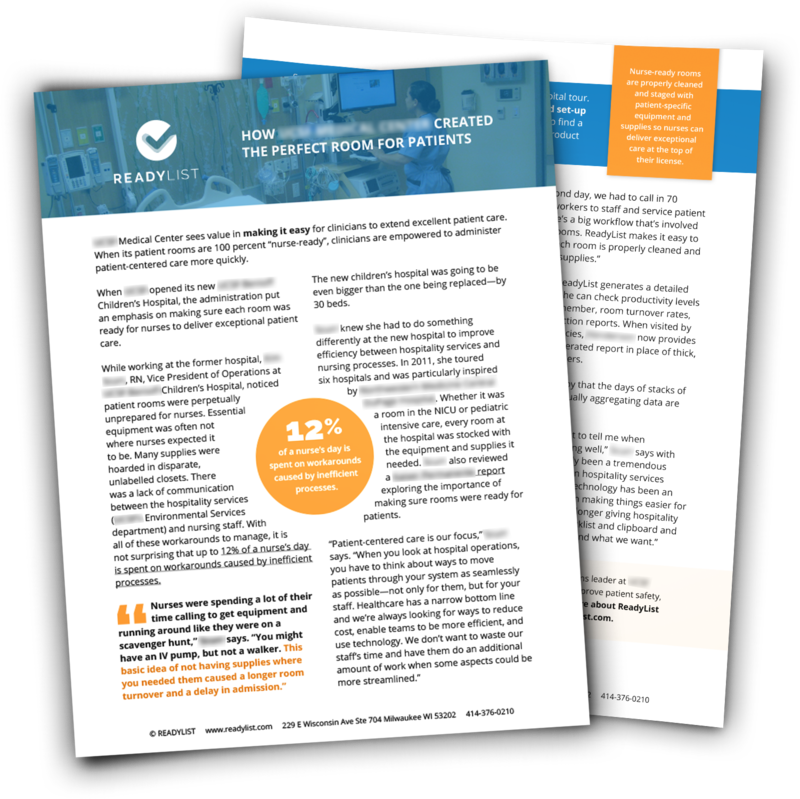 When opening its new children’s hospital, leadership at a Top 10 Academic Medical Center demanded workflows that make it easy for clinicians to extend excellent patient care. To implement the nurse-ready room model, they instituted work groups with representatives from Nursing, Environmental Services, and Material Services-Central Supply. The collaborative uncovered a myriad of challenges, then designed an interconnected set of workflows to prepare rooms that are always ready for patient care. The result was a nurse-ready room model, built on ReadyList's Inpatient solution, that enables the entire healthcare team to better communicate and run efficiently. 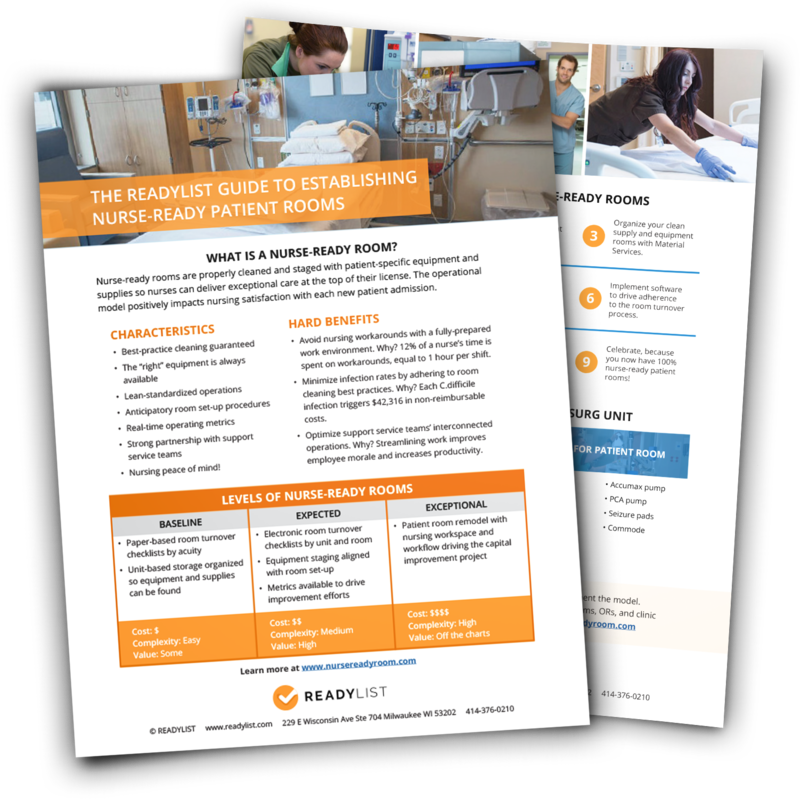 Learn how to implement the nurse-ready patient room model at your medical center in this three-part educational video series from ReadyList CEO, Brian Herriot, a recognized expert in hospital operations. Each video is less than 10 minutes. Who prepares a nurse-ready room, and what are the main challenges? How does “nurse-ready” work in practice? A use case. model. To implement your own nurse-ready room with ReadyList, click here.